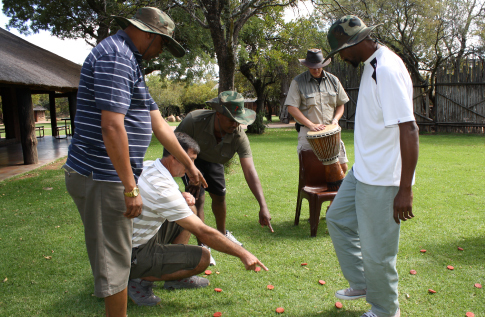 Corporate Teambuilding & Adventure enhance Team cohesion through Interactive Fun Activities. The race is on – teamwork is of paramount importance for any company. Team buildings for large corporate groups. It is ideal to have the whole company or a specific department take part in a fun filled day out. Treat everyone to a fun in the sun day with a year end function or bring everyone to a constructive day. These activities are suitable for 20 – 400 pax. The delegates are divided into smaller groups (8-12) to engage in 8-12 activities – on a rotational basis. Activities are interactive, creative and loaded with fun. Kwalata Game Lodge is located at the Dinokeng Big 5 Game Reserve in the northern corner of Gauteng, next to the N1 Highway. The Dinokeng Game Reserve accommodates all of the big five free roaming, and offers great plains game viewing close to Pretoria and Johannesburg. It is the perfect malaria-free stop-over to or from northern destinations, only one hour drive north of OR Tambo International Airport.